Following on my previous post here I show the GDP per capita (2008). First per country as you can see in the next table. Germany, France and the U.K. are not in the top, while they have the highest number of inhabitants. Norway, Switzerland and Denmark are the top three (besides Luxembourg). 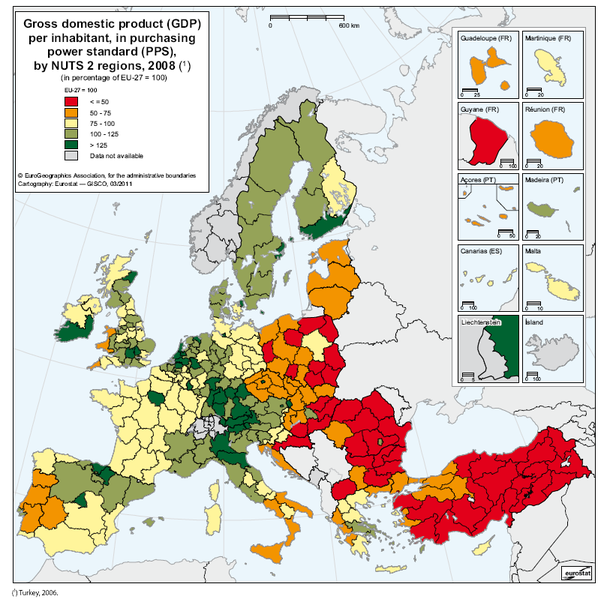 Bulgaria, Romania and Poland have the lowest GDP per capita. In the next graph you can see the GDP per capita on the regional level. Again England, the Netherlands, West-Germany, Switzerland and North Italy stand out.